Pit Bull Motorcycle Stands Unchained! As you might have gathered, we are working hard to increase our product offering in the parts and accessories category this year. Pit Bull Motorcycle Stands was an easy brand to bring on considering their strong reputation and wide product range. Consider the Pit Bull unleashed at RevZilla. In the world of motorcycle stands there are many brands to choose from, but there are a few key things that set Pitbull stands apart. First, they are made from only the highest grade US steel, which is coated with a layer of zinc for longevity and protection against the elements. Their junctions are hand-welded with care and continuous tubing is used wherever possible for added strength. Pit Bull Motorcycle Stands are also designed with a good deal of thought put into adjustability so that they are able to fit the vast majority of situations. Not only do they make bike-specific stands for virtually anything currently on the market, but the interchangeability of parts, spools, and handles,make it easy to quickly switch out one fitment for another. In addition to the utility of their stands for maintenance and routine bike work, Pit Bull also makes a nice selection of products for the racing community as well. Items like the Pit Bull Tire Tree or the Pit Bull 6MM Spool Kit make it easy for you (or your team) to be fast and efficient in the pits. Also worth mentioning, Pitbull's selection of hybrid stands are available for those who want the flexibility to switch between a fork stand and a triple clamp stand. Consider the hybrid Pit Bull Ducati Stand, for instance. 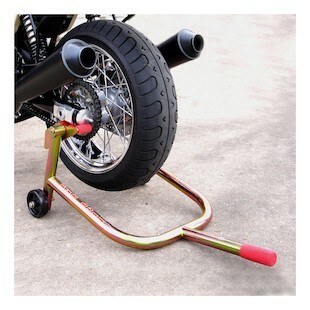 Take a browse of the Pit Bull Stands available at RevZilla.com to see what is available for your motorcycle.